Why Choose St George’s College? 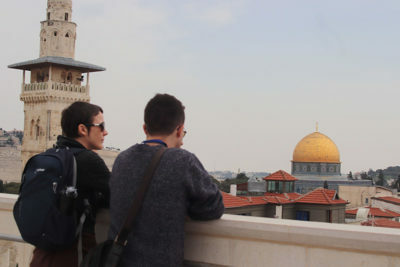 St George’s College, Jerusalem has been offering pilgrims from around the world a unique experience of the biblical lands for more than 50 years, and its foundation dates back to 1920 when it was established as the Anglican theological college for Arab clergy in the Middle East. These days there are many commercial companies offering pilgrimage services, as well as advocacy visits sponsored by activists from various political and religious perspectives. We believe that St George’s College offers a comprehensive pilgrimage experience that is second to none. Our study pilgrimage courses set us apart from commercial pilgrimage tour operators as well as the advocacy and solidarity visits offered by international NGOs. In 2020 we celebrate 100 years since our establishment, and from the beginning we have served the local Anglican Arab communities in the Middle East, and especially in Jerusalem. We are a Palestinian Christian institution with a long term commitment to the communities that make up this diverse country. 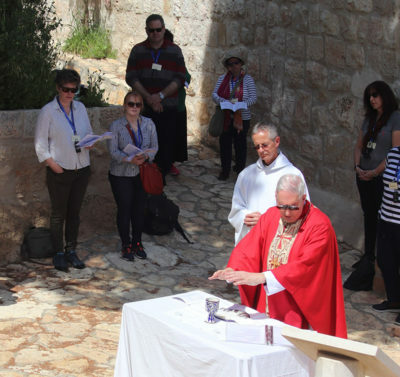 St George’s College is a project of the Anglican Diocese of Jerusalem and the Middle East and it is rooted in the lived realities of the local community. We do so much more than impart information. Our course leaders are equipped to teach the history and archaeology of the land and the faith which has shaped it in the past and the present. Carefully thought through programmes enable people to reflect and to learn whatever their prior level of knowledge. The College enjoys the daily pattern of worship of the Cathedral which is on the same site. Every day on our courses is bound together in prayer so that they are a great deal more than a tour of fascinating places. Our study pilgrimages are transformative spiritual experiences which are led by experienced clergy. Courses inspire and equip people to deepen their faith. Rather than staying in hotels, St George’s has its own premises, just ten minutes’ walk from the Old City of Jerusalem but it is a peaceful idyll in which to study and to rest. Rooms are comfortable with en suite facilities, the learning environment is outstanding and there are comfortable areas in which to socialise. Meals are provided in the Pilgrim Guest House which is an attractive context for dining and for fellowship together. Accommodation outside Jerusalem is chosen to provide similar levels of comfort. We hope for these reasons and for many more, that those looking for a deep, well-informed pilgrimage, rooted in the lives of the local Christian community, will choose St George’s. Please look at our testimonials here to see what people say about their time at the College.